Growing up my memories of Roberto Carlos were listening to him along with a batch of romantic male singers like Camilo Sesto and Emmanuel from my parent’s modest record collection, but those were the 80’s, little did I know that Carlos by then had not only made a successful crossover into the Spanish market but globally as well,even singing in French and Italian. 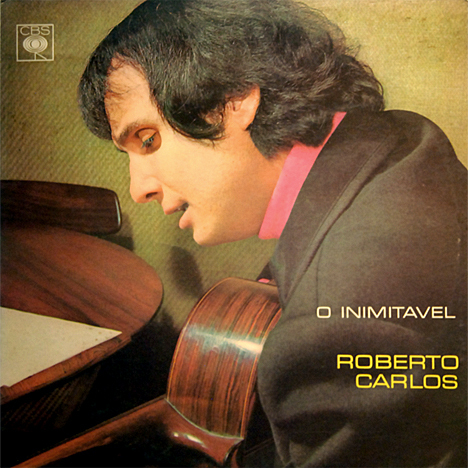 Prior to this Roberto had already established a career that began in the early sixties and seventies in Brazil composing a number of pop hits in his native Portuguese with the help of a fellow friend Manuel Morais and his half brother Erasmo Carlos. With a strong interest in American rock n roll that included Elvis, Roberto developed his own take on rock music, a mix between a slow soulful serious groove and at times cranking out some pretty sick fuzzed out garage rock. Maluca Beleza recently released a compilation titled Jovem Guarda Golpe Final – Beatfreak & Soul Psych Brasileiro that features three tracks by Roberto Carlos that really turned me on again to his music. So given Sonorama hasn’t really covered anything Brazilian lately I thought it would be a good chance to revisit Brasil. Here are three cuts from Roberto Carlos’ 1968 outing O Inimitavel.